Exactly what are zoonoses? Canine Zoonoses is the term applied to a grouping of diseases that are very easily transferable from canine (or feline) to human. Basically, these diseases fall into three separate groupings based on their means of transmission from dog to human. This also groups these diseases, ideally, in the means of how they are treated and controlled. The three groupings of canine zoonoses diseases are as follows -diseases spread through :1) urine or feces, 2) hair and skin contact, or 3) bites and scratches. 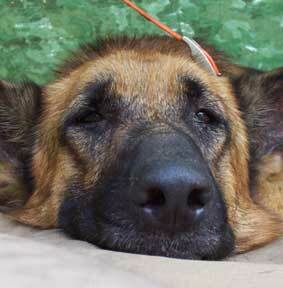 Hookworms enter the German Shepherd's body in the area that directly comes in contact with the feces-contaminated soil. Seen more commonly in the South, these parasites are unsuited to ideally live in human beings. German Shepherd's may come in contact with this disease through swimming, drinking, licking their fur, or by eating food contaminated with animal urine.Many animals may carry this, though rats are most often the culprit. This zoonoses symptom in humans include flu-like including chills, body aches, vomiting, fever and headache. Sometimes kidney damage may occur or the membranes covering the spinal cord or brain may become inflamed. This disease is not usually fatal though it does make its host miserable for weeks at a time. If these parasites are swallowed by humans they migrate into the body tissues and may cause damage, including symptoms of fever and liver enlargement which can last up to a year in length including symptoms of fever and liver enlargement which can last up to a year in length. These parasites are most commonly found in small children (2-4 yrs. of age) who mistakenly swallow the eggs and become infected. Children playing in an area in which an animal has defecated in the past, who do not wash their hands after coming in contact with the eggs and inadvertently sticks their hands into their mouth are the most common receptors of Roundworms. Only rarely fatal, the disease is traditionally mild though it may be long lasting. Tapeworms can easily be ingested by any German Shepherd who swallows a flea carrying the infected form when biting at or chewing their coat. Children may get it virtually the same way- minus the coat chewing. Tapeworm infestation in humans this way is actually quite rare when compared to infestation from eating undercooked pork or beef. Rarely this may cause death in humans since most people develop a resistance to it during normal exposure. It can cause many types of birth deformities in children born to mothers who have been infected for the first time without having developed an immunity before becoming pregnant. Most commonly this is “picked up” through contact with infected cat feces or in contact with contaminated soil. 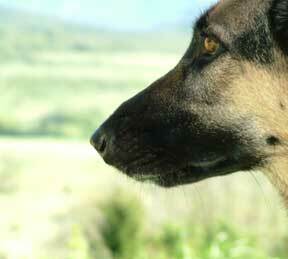 There are a few basic precautions everyone should take to prevent transmission of any of the above canine zoonoses. First, clean up all pet droppings and wash your hands each time you any come in contact with contaminated soil. It is extremely important to teach children these steps. Also, if your German Shepherd has gone wading or swimming in any water which may have become contaminated with animal urine, bathe it at once when you return home. Fleas prefer feeding on your German Shepherd though they will not turn up the chance of of making an occasional meal on humans as well. Most commonly found in children (though anyone may be infected), this disease is caused by a skin/hair eating fungus which first appears on people as a round, red, scaly area. It grows outward in a circular formation and is the most common fungal disease currently reported. Tick borne, this disease or Canine Zoonose can cause symptoms such as fever, chills and headache though it is not usually fatal. Symptoms may last many weeks and it can be treated with antibiotics. Most commonly this disease is transmitted through the bite of an infected tick. Also, you may become infected while pulling a tick off your German Shepherd. It is best to wear gloves when removing ticks from your dogs. The less commonly found version of mange (as opposed to the demodetic version), this may still cause intense itching , irritation and thickening of the skin. Animal mange may live in human skin though it cannot reproduce there. Humans have their own version of the scabies mite. Overall, proper nutritional care and health of your German Shepherd is the best defense against the chance of your dog harboring any of these diseases. Frequent grooming and herbal repellents are good choices in combating most of these diseases and conditions, aka Canine Zoonoses before they become major. Stress, roaming and contact with other dogs are the three most common points of transmission among any of the canine / feline diseases mentioned above. Wash your hands after dog contact and minimize contact with any infected pet or animal until the problem is cured. Some people will develop a fever, enlarged lymph nodes and malaise near the area of a bite or scratch from a cat a few weeks after the occurrence. Though not fatal it can be very uncomfortable and can be followed by complications. Infected cat bites may become infected with an entirely different bacteria though the symptoms are similar. Probably best, is to thoroughly wash an area bitten or scratched by a cat and to clean it liberally on a frequent basis to, hopefully, prevent infection. Virtually 100% fatal once the clinical symptoms appear, this canine disease is carried by a virus transmitted through the saliva of an infected biting animal. Symptoms include frothing at the mouth, extreme behavioral/personality changes and convulsions which usually ends in the aggressive, staggering and bleary- eyed condition. If you happen upon an animal showing any of these disease symptoms, get away from it as quickly as possible and call your nearest animal control unit. If by chance you are bitten, try to follow it to where it lives (if it is a stray) so that the proper officials may capture it for testing. If you do kill it, do not injure the head as this will be needed for verification. Also, if you are bitten by an animal exhibiting any of the symptoms above, thoroughly wash out the wound as quickly as possible and contact your personal physician immediately. Overall, your chances of getting rabies are rare though you can never be over cautious. Best advice, keep your German Shepherd and all of your dogs in tip-top physical condition through exercise, canine dietary supplements and proper nutrition to reduce its chances of picking up any diseases or parasites from less healthy animals. Also, try to minimize your pets contact with wild animals or sick pets and make sure that it is always current on its vaccination schedule.